Alice Malsenior Walker (born 9 February 1944) is an African-American author whose most famous novel, The Color Purple, won both the Pulitzer Prize and the American Book Award. Foreword to The Dreaded Comparison: Animal Slavery and Human Slavery (1996) by Marjorie Spiegel, p. 14. Possessing the Secret of Joy (1992). On living in California, as quoted in "A long walk to freedom" in The Guardian (25 February 2001). The harm that you do to others is the harm that you do to yourself and you cannot think then that you can cause wars in other parts of the world and destroy people and drone them without this having a terrible impact on your own soul and your own consciousness. 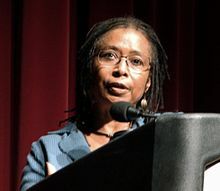 Poet, Author Alice Walker Meets the Inner Journey with Global Activism in "The Cushion in the Road" (May 28, 2013). You're all I want! You're all I have! GO AWAY! . Alice Walker's archives at Emory University.